It is an amazing privilege to have two such nice three-year-olds as Tivaci and Tulsa in the stable at the same time and we are very excited that they will be representing Ballymore Stables in two feature races on Saturday... Tivaci to take his place in the Gr.1 Australian Guineas at Flemington whilst Tulsa heads to Sydney to contest the Gr.1 Randwick Guineas. Unfortunately again drawing awkwardly, Tivaci nevertheless has great lead up form for the Australian Guineas having been so tough when winning (on protest) the Gr.3 C.S Hayes Stakes two weeks ago. And we could not be happier with the way he has progress since - "he worked very well this week," Michael Moroney enthused, "and he looks terrific." Nick Hall rides Tivaci for the first time. Meanwhile Tulsa, who has drawn nicely in barrier six in the Randwick Guineas, has been worked the Sydney way of going in preparation and he has been shaping nicely. 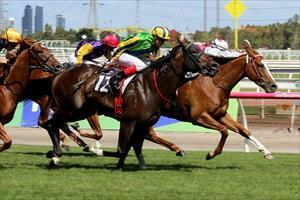 Third in Tivaci's C.S Hayes Stakes, the son of Sebring catching the eye with a strong late finish. He will be ridden for the first time by Steven Arnold.